Embraces open source hardware innovation for cloud. Microsoft and the Facebook-led Open Compute Project have released the design and specifications for the Project Olympus next-generation hyperscale hardware. As part of Project Olympus, Microsoft said it will contribute the design for a new universal server motherboard to the OCP. 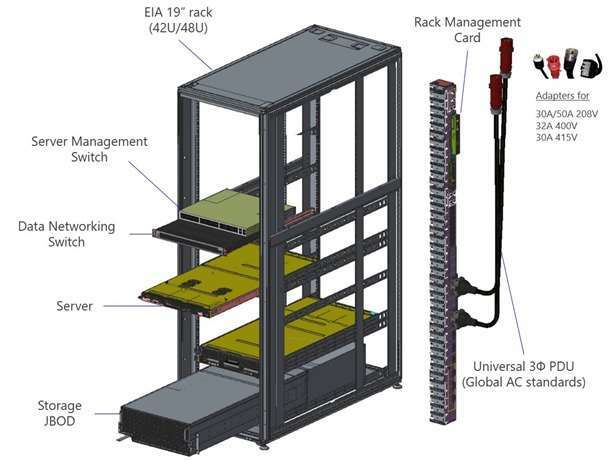 A one and a two-unit server chassis, a high availability power supply with batteries, a high-density storage expansion unit along with a new universal rack power distribution unit and a standards-compliant rack management card will also be contributed to the project. Project Olympus introduces an open software-style model for collaborative development of hardware. Microsoft’s designs are roughly 50 percent complete. “By sharing designs that are actively in development, Project Olympus will allow the community to contribute to the ecosystem by downloading, modifying, and forking the hardware design just like open source software,” Kushagra Vaid, Microsoft’s general manager of Azure hardware infrastructure said. Microsoft Project Olympus rack system. Microsoft has published the designs and specifications for some of the open source hardware on the Github source code repository, with the complete rack system to be posted in the coming weeks. The company said 90 percent of servers purchased for its data centres are based on OCP contributed specifications, having started reimagining its Azure hardware “through the lens of open source innovation” in 2014, the year Microsoft joined OCP.